It is hot here in the South! So I wanted to keep cool while preparing dinner and I had a little of this and a little of that so this is one of my garden, pantry raids this week. I imagine that it is pretty much the same with some of you who have a small garden, you have a squash here and a zucchini there, a pepper or two and an onion in the pantry. I had orzo in the pantry, too, so decided to use the tiny pasta for this dish. For this recipe I used a lemon pepper rotisserie chicken from the grocery store. I could have cooked a chicken but I am barely keeping the house cool at the moment. 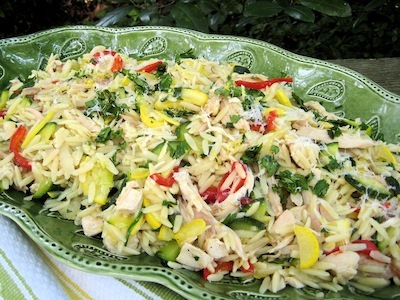 The orzo and vegetables cooked very quickly so all I had to do was add the chicken and a few other ingredients to make it tastier and I was ready to eat. By a few other ingredients I mean fresh herbs and lemon to bring out the freshness, and a little pecorino Romano to finish it. To make the cooking faster, I cut the yellow squash and zucchini into quarters and sliced them very thin and sliced the remaining vegetables into thin strips. I seasoned the orzo and the vegetables while cooking. I took a bite of the squash to check the seasoning and it was a perfectly cooked al dente to bring out the natural sweetness. This is one of those dishes that can be served hot or chilled, so if you want to make it early and serve it late, then just heat it up, or serve it as is out of the fridge. If you decide to replace my use of vegetable oil with olive oil for sautéing the veggies, just remember that olive oil congeals at low temperatures, so you might want to stay with the vegetable oil if serving chilled. This is one of those recipes that you can make for 20 or make for one or two. So just remember that you can use more or less of everything in here, just season well. Bring the water to a boil then add 7 ounces of orzo and cook until tender. This will take only a few minutes. Remove from the heat and drain. Set aside. Add the vegetable oil to a large heavy skillet over medium high heat. When the oil is hot, add the vegetables and stir fry. Add salt and pepper to taste and check for seasoning. Cook until vegetables are tender or al dente. Remove from heat. In a large bowl add the orzo, and the vegetables. Add the chicken, basil, parsley, and lemon zest and lemon juice. Check for seasoning. Adjust if needed. Serve on a large platter with additional chopped parsley, lemon zest and freshly grated pecorino Romano cheese on the top. Serves 6. Note: I used 5 cups of vegetables mixed with the orzo and chicken.